Adding to yesterday's overview of the jobs trends in the private sector, here is a look at what is happening at the industry level. Before we get down there, though, let us review some comparative numbers on government and private employment and compensation. Since the Bureau of Labor Statistics does not publish compensation data for government, we have to rely on the Bureau of Economic Analysis (BEA) for this part. 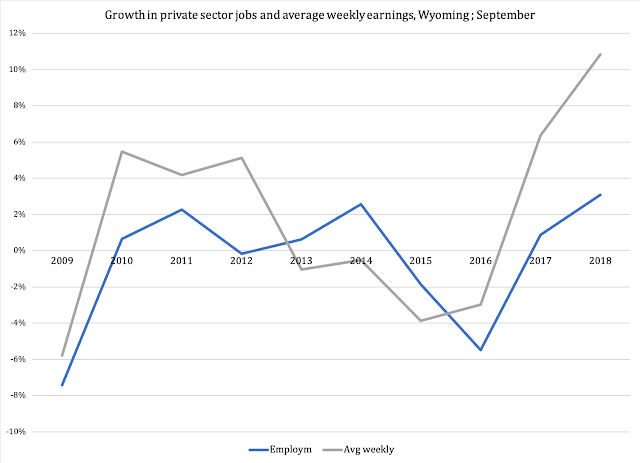 As mentioned yesterday, Wyoming has the highest Government Employment Ratio (GER) of all states; without having reviewed the data, it is reasonable to assume that we also have the highest government payroll per $1,000 private-sector payroll dollars. One reason for this is that compensation for the 90 percent private-sector employees who are not in minerals, is relatively small. A more detailed review is in the works to confirm (or disprove) this point. The 61,695 state and local government employees earned a total of $4.31bn in employee compensation. This comes out to a GER or 294 and a Government Compensation Ratio of 355, or $355 per $1,000 earned in the private sector. If we paid the compensation of government employees straight out of our private-sector employee compensation, it would come out to a 35.5 percent tax. There were 190,237 employees in on-minerals private industries, earning a total of $9.99bn. When we compare per-employee compensation in state and local government to the total private sector, it comes out to $69,793 in government and $57,837 in the private sector. This means that here in Wyoming, employees of state and local governments earn $1.21 for every $1.00 that people earn working for private businesses. However, if we deduct minerals, the remaining private sector pays $52,558, for a pay disparity of $1.33 to government. This, again, includes benefits. If we deduct them the non-minerals private employee earns about $42,000. This is a higher number than we get from BLS, where the same number lands a bit north of $37,000; personally, I prefer the BLS methodology, but since they do not publish comparable data for government, we have to rely on the BEA in this particular case. The difference between the two agencies has to do with how they account for actual hours worked, but it does not affect the comparison between government and the private sector that the BEA numbers allow for. As an interesting side note, consider the disparity between growth in employment and earnings in TTU. When earnings grow that much faster, the cause is very likely a capacity problem. In this particular industry I would guess that we are looking at a lasting truck-driver shortage problem. Yesterday's article reported that over the past ten years, which have been uniquely challenging from a macroeconomic viewpoint, Wyoming has the worst private-sector jobs growth of all the 50 states. The positive numbers in Figure 1 and Table 1 give us hope for a better future, hope that could easily be squashed by a tax hike or two. There are politicians who will use these numbers to motivate more corporate-welfare spending. They suggest this will bring more high-paying jobs to our state and thereby balance up the earnings disparity between, in particular, minerals and the rest of the economy. However, corporate welfare works much like individual welfare: people will adapt their behavior to it. Businesses tend to stay in a place for as long as the government checks keep coming. Once the tax-paid faucet dries up, they move on. Structural reforms to government spending.